I am a Christian woman who is the wife of my dear husband, Steve, and mom to 7 wonderful children. We homeschool ’em all in a mostly Charlotte-Mason style. Our family lives in a 1400 square foot home in Ontario, Canada. I love crafts and healthy eating of lots of whole, local foods. This is soooooo cute 🙂 You have a beautiful baby! 2nd, i’m a bit intrigued on your returning to meat-eating. i have also been a vegetarian for much of my adult life (however, i’ve always eaten meat in my pregnancies for a couple of reasons). i’ll be honest, i have not read nourishing traditions, tho it keeps getting recommended to me, so if this info is readily available in that book, my apologies. i guess i’m wondering what officially pushed you back into eating meat? one reason i ask is that my husband (who used to be mr meat and potatoes, lol) has not only joined me in vegetarianism, but actually is a vegan now, and has enjoyed MULTIPLe (sorry my e won’t capitalize) health benefits from it. i’m not sure he’ll ever eat meat again! 🙂 i’d just love to hear more about this journey (was your family also vegetarian?) if you had the time or could point me in the right direction if you’d already posted about it. Misty — so glad you found me again! 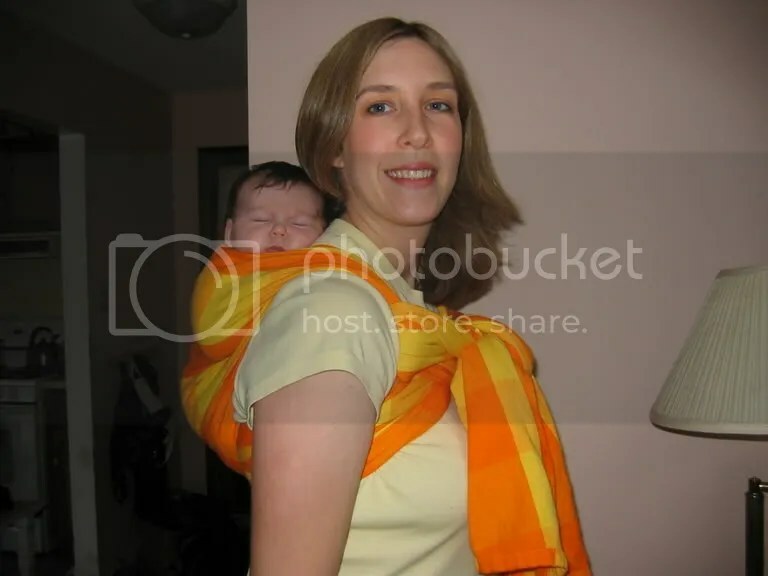 The link for the newborn back carry I am doing can be found here: http://www.thebabywearer.com/forum/showthread.php?t=240368&highlight=newborn+carry I believe you need to be a member of the forum to see posts. Congrats on your new babe to arrive soon! That is very exciting. Our return to meat-eating — Why don’t I work on a blog post about this, as I have been asked lots of times. I think a post would be a great way to give the best answer. I’ll work on that over this weekend, hopefully! I thought it was interesting that your husband is now a vegan. Mine did join me in vegetarianism and we all enjoyed health benefits, but he sure didn’t balk too much when I said I thought we should consider returning to eating meat. I am looking at your blog and saw the real diapers. My sister just had a baby and can’t afford diapers, she was downsized at the time of her Maternity leave. So I wanted to make her some of these. Please tell me where to get the things to hold the diapers on. They are so cool but I do not know what they are. We used to have diaper pins, but they are no longer.. I came across your website doing a search and I gotta say that you look very familiar to me. Your maiden name wouldn’t happen to be Gauld, by chance? Did you grow up in Alberta? I knew a girl named Christine Gauld who was from Calgary. I have always wanted to get in touch with her since we lost contact some 15 years ago. She was special to me because she was the first christian I ever met. Thanks either way. I’m a new reader here by way of the SCM forum. I’ve really been enjoying reading your blog posts. I can relate to many that I’ve read so far. I just wanted to say “hello” and to thank you for your post on your favorite cookbooks. I had never heard of the “More with Less” cookbook, so I checked it out from my library this week. It is exactly the kind of cookbook that I’ve been looking for for quite a while. Anyway, I’ll be back to visit again soon, I’m sure. Thanks so much for visiting, Anna. I’m sorry I haven’t been posting recently. I am using my husband’s work laptop, as we have been computerless for awhile. My brother is going to be rebuilding our computer. He is wonderful and we so much appreciate his free tech support, but of course, when it is free, it is not always on our timetable. I can be patient, though. I’m wondering if you can point me in the right direction for the perfect sock pattern to knit – keeping in mind this will be first attempt! It’s always great to read your blog! Hi Christine! I’m not sure if you still check in here, but I had a question about your ‘sprout genius’ diapers. Did you just use the sprout snap pattern and ,ale pockets out of it with snaps laid out the same as BG, or was there another step in between? I’m about to embark on some diaper making and love how your SGs turned out! By the way, I am also in Ontario!